The annual General Congress of both the European Softball Federation (ESF) and the Confederation of European Baseball (CEB) took place on the second weekend of February in Hoofddorp, Netherlands. The Courtyard Marriot Hotel provided facilities for the delegates, partners, special guests, officials and representatives from the World Baseball Softball Confederation (WBSC). The joint event is not only the setting for Commission meetings and the Congresses themselves, but it also serves as an opportunity for sessions on regional cooperation, ESF-CEB discussions and meetings with WBSC Softball and Baseball Division representatives, as well as spontaneous debates, consultations and networking. This is the place where new partnerships, projects and plans originate. The ESF was proud to welcome WBSC President Riccardo Fraccari together with fellow representatives from the WBSC Softball Division: Dale McMann, Darryl Clout, Francesca Fabretto, Ron Radigonda, Michael Schmidt, Laurie Gouthro and Bob Stanton. The ESF also welcomed the KNBSB President, Ron Schel, and ASA Executive Director Craig Cress. At the Financial Commission on Friday morning, the final ESF accounts for 2015 were discussed and a draft of the 2016 budget was presented. Delegates from affiliated national federations had a chance to make comments and suggestions. The budget for 2016 was approved by the delegates the following day during the Congress plenary session. The Development Commission is involved with a large number of projects, and these were presented and explained in the General Progress Report handed out at the session. A separate article, “Development – Entering 2016”, sets out the basic ideas behind the projects. An update on slowpitch progress was presented as well. The General Progress Report 2016 is available on the ESF website. The Communications Director presented a report on her activities in 2015. The two main objectives -- to operate ESF media channels on a daily basis and to provide an information service to a European audience -- were seen as successful, although the latter is still a work in progress. Plans for 2016 were laid out, including campaign-based promotion of live broadcasting, the implementation of a new media accreditation system and a focus on communications directed outside Europe. Youri Alkalay talked about marketing ideas and projects planned for 2016. A chain of contest events will be devised to entertain fans, coaches and players, and PhotoFEST will be repeated in different forms (video, professional photos, amateur photos, T-shirt design). The ESF’s corporate identity manual will be transformed into a more user-friendly interface and, finally, the Competition Locator will be filled with data throughout 2016. This Commission, which is concerned with ESF tournaments and has a direct effect on players, coaches, umpires, officials etc, confirmed the final locations of all 2016 official competitions. To everyone’s delight, at the last possible moment, Italy placed a bid to organize the Men’s Super Cup, where the New Zealand Black Sox have pledged to participate. The Men’s Super Cup is the biggest official tournament the ESF will run this year, with 22 teams competing. The Slowpitch Super Cup also promises a good-quality tournament, with a record 15 teams signed up. A number of other issues were discussed (the Pick-up Player rule, the EMRYT, resolution of ties, TC reports etc) and you can learn the details in our “News -- Technical and Competitions” section. On Sunday, prior to the ESF Congress plenary session, the CEB Congress was held. The ESF Congress started off with with a video clip ESF 2015 Highlights. 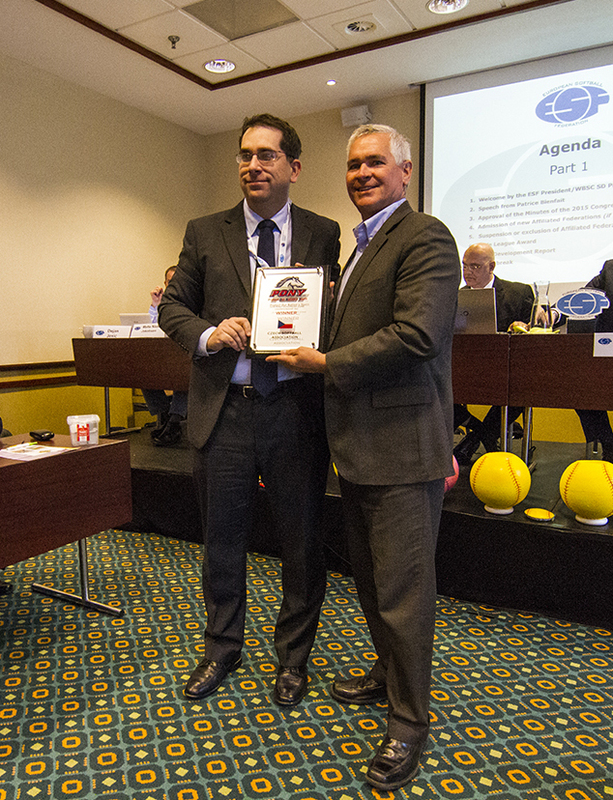 During the ESF Congress, summaries from the Commission meetings were presented, and awards were made. Daniel P. Velte and Sara Thompson presented the Little League Award to the Netherlands, and Abraham Key, representing PONY Baseball and Softball, presented a plaque to the Czech Republic as winners of the 2015 U-16 Pony Championships. Craig Montvidas and Mattias Grimstoft talked about the experience of being a coach as part of the European Softball Coaches Association presentation. Michele Smith offered the hospitality of the Clearwater Sports Commission complex to European Federations and teams. This year’s session had a new element in the form of a panel discussion. Led by Ron Radigonda, representatives of four European countries (the Czech Republic, Great Britain, Italy and the Netherlands) introduced their Federation structure, national competition schemes and development progress and shared their ways of bringing new people to softball. This part of the Congress could have easily taken the whole day, as there is a lot of experience to share and many topics to discuss. The concept was to give smaller and younger federations ideas on how to develop and fight for success. At 5.00, the draws for European Championships were scheduled. You can review the pools for the three 2016 Championships below. Before the end of the Congress, one more decision had to be made, as the location of the next Congress was subject to a vote. Lyon in France and Belgrade in Serbia were the candidates and in the end it was Serbia that won the right to organize the next Congress in February 2017. Dale McMann, WBSC Softball Division and ISF President, then addressed the Congress and expressed his delight at the allocation of the 2019 Men’s Fastpitch World Championship to Europe. The tournament will be held in Prague, Czech Republic. ESF President Andre van Overbeek then thanked everyone for their dedication to softball and closed the 2016 ESF Congress. As mentioned above, the annual Congress provides a great opportunity for various debates and meetings. Members of the ESF Executive Council used the opportunity to get together with WBSC Softball Division representatives and catch up on the latest news and plans from the world governing body for softball. The whole softball and baseball world is awaiting the big Olympic decision in August and everyone, including WBSC SD representatives, seems positive about the inclusion of our sports, although admitting that it’s not confirmed until it’s confirmed. The first Open Women’s World Championships will be held this year in Canada, and Laurie Gouthro is very excited about the number of teams that have already signed up. We’re hoping that the expected number of eight European participants at the Women’s World Championships will be confirmed when the deadline for entries on February 24 has passed. The first sessions of the Joint Commissions that were established recently by the EBSSC took place shortly after the members checked in to the Congress hotel. Commission members met for the first time to figure out major principles and means of further cooperation. The Marketing Commission agreed to focus on a project to raise public awareness of our sports among the European public, and to promote the two sports together. The Operations Commission will begin by recommending to the EBSSC a standard procedure for preparing a Joint Congress. Other joint events will be considered after the first task is completed. The Development Commission met and will be looking to define exactly what is meant by development and create a common understanding of what needs to be developed and how. The Commission will also investigate the initial impact of BeeBall in Europe to evaluate its viability as a tool for the development and acceptance of baseball and softball throughout the continent.